Not much is known about this Gloriana St.Clair,who is trying to steal our Israel Caine. All I know is that I like her! Finally he is dating a real woman! So move on over you skinny minnies out there because the big girls are making a comeback! I will try to find out more about her but for now girls show your support here! Grease and floor muffin pan (or use paper liners). Beat together butter, eggs, salt, and sugar. 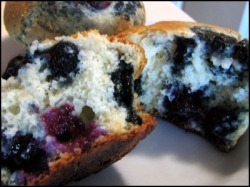 Starting today we are going to start a blueberry recipe exchange. So start sending in those recipes! Here is one to start you out! This makes a very nice light dessert or snack. Make the blueberry sauce/puree first, as you need some to make the pasta. 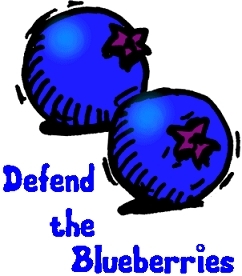 Place the blueberries in a saucepan, cover with water, add the sugar lemon juice and cinnamon and cook over a medium heat. Once the berries have slightly popped, take out 1/2 of the sauce and berries to use for the pasta. Mash with a fork or puree with a blender. Using a food processor make the pasta dough so that it forms a solid ball. Roll the dough out on a lightly floured surface and cut the tagliatelle shaped strips, or wind through a pasta machine. Let the pasta dough dry while you make the amaretto sauce. Mix the ingredients for the amaretto sauce together for a creamy smooth sauce. Cook the pasta in boiling water until al dente. It will only take 3-4 minutes if the pasta is fresh. Serve the pasta with the amaretto sauce and the blueberry sauce. It can be made non-alcoholic by omitting the amaretto and using almond flavor instead.